On Oct. 30, 2017, third-year JD student Pete Sabori (Gila River/Hopi) became the first University of Arizona Law student to appear as a student practitioner in tribal court representing a tribe. 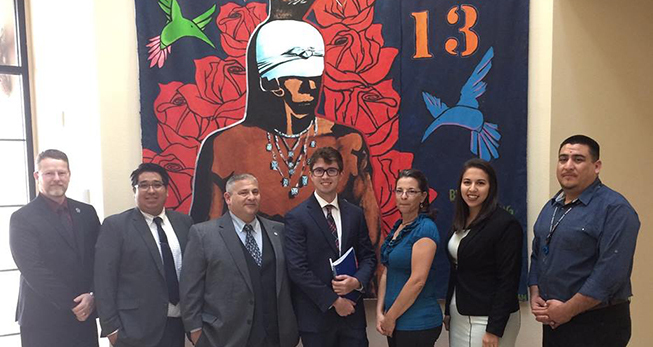 As a participant in Arizona Law’s Tribal Justice Clinic, Sabori represented the Pascua Yaqui Tribe, acting as a prosecuting attorney in a juvenile criminal case. Sabori acted as lead counsel during the October court hearing thanks to a new student practice rule adopted by the Pascua Yaqui Tribal Court, allowing students enrolled in the Tribal Justice Clinic to appear in court under the supervision of a licensed attorney. In addition to giving students practical courtroom training, the Tribal Justice Clinic addresses a wider community need to train lawyers in how to practice in tribal court settings. Tribal Justice Clinic Director James Diamond serves as special prosecutor with the tribe and is assigned cases when there is a conflict of interest. Cases are assigned to Diamond by O.J. Flores, the tribe’s chief prosecutor and an Arizona Law alumnus. Under Diamond’s supervision, Sabori and his teammates, second-year JD student Alexis Zendejas (Omaha) and Master of Laws student Derek Kauanoe (Native Hawaiian), worked on the juvenile criminal case and attended court proceedings throughout the fall 2017 semester. The students joined Diamond in several court appearances, prepared pleadings and motions, and negotiated and conducted a case adjudication. Garrett Holm (Cherokee), along with Sabori and Kauanoe, was one of three clinic students who passed the Pascua Yaqui Court Tribal Bar Examination this spring. Holm led the legal efforts of a second team of clinic students, prosecuting an adult criminal case involving a serious assault that took place on the reservation. Holm represented the tribe in the case in an early January 2018 plea and sentencing hearing. The Pascua Yaqui Tribe has made great strides in addressing barriers to justice faced by Yaqui community members. Through implementation of the Tribal Law and Order Act and provisions in the Violence Against Women Act that extend tribal jurisdiction to non-Native offenders of domestic violence, the tribe has gained recognition as a leader in innovative approaches to tribal law and justice. Arizona Law’s Indigenous Peoples Law and Policy (IPLP) Program has a long-standing partnership with the Pascua Yaqui Tribe. Collaborations between the Tribal Justice Clinic and the Office of the Prosecutor afford students the chance to work with leading legal practitioners and increase access to justice for Yaqui community members. In addition to the work as prosecutors, Tribal Justice Clinic students engaged in a variety of civil litigation and administrative and regulatory work for tribes and indigenous peoples across the country. Some recent projects include clinic students serving as law clerks on behalf of water protectors resisting the Dakota access pipeline in North Dakota, drafting an environmental regulatory code for the Yurok Tribe of California, and drafting a code of evidence for the Tohono O’odham Nation of Arizona.